I thought I’d share a few simple tips with you for storing, cutting, peeling and deseeding tomatoes. These will come in handy when you are blessed with an abundance of garden fresh tomatoes (like we are right now). 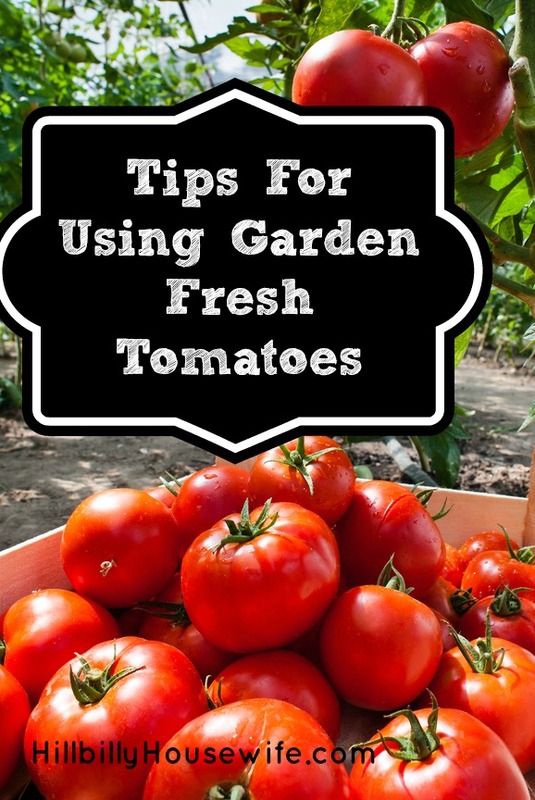 These tips will come in handy if you grow your own, or get a big basket of tomatoes from a kind neighbor, or just come across a deal at the farmers market or store that’s just too good to pass up. Before you can put those tomatoes to good use in pasta sauce, soup, or even tomato pie, you need to know how to properly store and prepare them for cooking. The best place to store tomatoes is right on your kitchen counter. Avoid direct sunlight though. You can also keep unripe tomatoes on the counter for a few days to allow them to finish ripening. If you need to speed things up, stick them in a brown paper bag with a banana. Bananas release ethylene that will help speed the ripening along. Tomatoes release their own, which is what allows them to continue ripening after they are picked. If you want to slow things down and need a few more days before using your tomatoes, store them in a cool, dry and dark place like a cellar or cupboard. Do not store your tomatoes in the fridge. The temperature difference is too big and will cause your tomatoes to turn mealy. Stick with room temperature or slightly below to store your tomatoes. There are lots of recipes out there that call for skinned tomatoes. Here’s the easiest way I know to get the skin to peel off. Get out a large pot and bring water to a boil in it. Clean any lose dirt off your tomatoes and cut a small x in the top of each tomato. While you are waiting for the water to boil, prepare a large bowl of ice water. Keep extra ice handy to add in case the water starts to warm up. If you’re only peeling a few tomatoes, that shouldn’t be needed, but if you’re working with a big batch, it will come in handy. Gently set a few tomatoes at a time into the boiling water. Let them cook for up to a minute. Remove them with a slotted spoon and set them in the bowl of ice water. When the tomatoes are cool enough to handle, peel off the skin starting at the spot where you cut the “X”. You’ll notice the skin starts to peel back and loosen after the tomatoes hit the ice water. The best time to deseed tomatoes that you are peeling is right after you follow the instructions above. Once the skin is off, cut the tomatoes in half and squeeze out the seeds. If you are using fresh tomatoes and plan to keep the skin on, you can quarter them and use a knife or spoon to scoop out the seeds. If you plan on using whole tomatoes (to fill them), cut off the bottom and then use a spoon to scoop out the seeds. Make sure the core is all the way out before trying to scoop out the seeds. The key to cutting tomatoes is to use a very sharp knife. If you are slicing them, a serrated knife (like your bread cutting knife) works best. Lay the tomato on its side. You’ll start slicing at the very top of the tomato, ending down at the core. Discard the last slice or two that have the core in them, or cut away the tomato flesh and use it for chopped tomato recipes. (Of course you can always sprinkle on some salt and eat it, too). Tomato slices are usually meant to be about 1/4 of an inch thick when called for in recipes. To chop or dice tomatoes, cut them in half length-wise using a paring knife. Cut each tomato half again, creating quarters. Cut out the core and seeds of each tomato quarter. Lay the tomato pieces skin side down on a cutting board and cut them into strips. Rotate your strips and cut into cubes. My favorite way to freeze tomatoes is already prepared as tomato sauce, tomato soup or stewed tomatoes. Just use the recipes below and freeze any leftovers. Peel and deseed your tomatoes using the instructions above. Squeeze out any excess water and put the tomato pieces in a freezer bag. Squeeze out as much air as possible and freeze for up to a year. Thaw your tomatoes overnight in the fridge and use in your favorite recipes.